The 2016 Dodge Challenger is a magnificent muscle car that delivers sharp exterior style, rich interior comfort, and high-performance hardware. 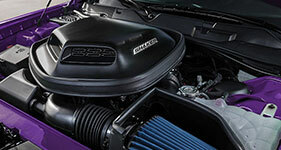 The Challenger powertrain options are sporty and responsive, supplying the speed you crave. Inside, the Challenger outdoes competitors with generous passenger space and comfort. This muscle car is also big on infotainment and safety technology to keep you connected throughout your travels. When you shop for a 2016 Dodge Challenger, there’s no shortage of powertrain options. You’re guaranteed to find a model that supplies the performance you crave. One popular choice is the 6.2-liter V8 engine, which generates 485 horsepower and 473 pound-feet of torque for superb muscle-car speed. The Challenger’s six-speed manual transmission is the perfect pick for driving enthusiasts, because it gives you complete control over your performance. Choose the eight-speed automatic transmission for a smooth, luxurious ride. 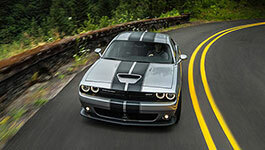 In action, the Dodge Challenger is nothing short of spectacular. The Challenger’s sharp, smooth ride quality is one of its signature traits. High-performance handling boosts driver confidence on curvy mountain roads. All powertrain options are responsive, getting you up to speed in a snap. If you crave tire-burning speed, you’ll certainly find it here. The 2016 Dodge Challenger pairs substantial performance with maximum safety. In government crash tests, the Challenger earned a perfect five-star rating for overall safety. This muscle car provides powerful stops, thanks in part to its excellent antilock brakes. The rearview camera makes backing up a simple task. Advanced technology, like the blind-spot alert system, monitors your surroundings and reports any potential problems. The forward collision warning system can detect an imminent crash. Inside, the Dodge Challenger offers sporty modern style. Old-school elements, like the T-handle automatic transmission shifter, blend with the Challenger’s cutting-edge comfort features. The two-tone leather seats deliver a classy vibe and world-class passenger comfort. Heated and ventilated front seats ward off discomfort, no matter what the weather. The trunk provides generous space, with 16.2 cubic feet for your shopping bags and weekend luggage. The Challenger cabin is also home to innovative tech features. The central Uconnect system supplies smartphone integration features, giving you the power to make hands-free calls and stream music. Use the navigation system to explore unknown territory without getting lost. The Challenger’s USB port makes it easy to keep devices charged on the go. Keyless entry and ignition features offer a quick getaway. The SRT Hellcat is never short on speed, with a supercharged 6.2-liter V8 engine that makes 707 horsepower and 650 pound-feet of torque. This all-out muscle car also comes with unique performance hardware, like the upgraded steering system. When you choose the SRT Hellcat, you’ll enjoy a one-day course at the SRT Driving Experience School, where they teach you the tricks of the trade. Cutting-edge infotainment for the modern driver. The 5-year, 60,000-mile powertrain limited warranty has you covered. The SRT Hellcat surges forward with 707 horses. In addition to sporty exterior style, the Challenger provides seamless interior comfort. For drivers who crave pure speed and style, the 2016 Dodge Challenger is a best-in-class pick. This muscle car provides much more than stunning performance. Inside, the Challenger is roomy and accommodating; its high-end comfort features help you make the most of your ride. Cutting-edge safety features provide the protection you require. When it’s time to hit the road, you’ll enjoy sharp steering, responsive handling, and substantial horsepower. Feel the power of the Challenger on a test drive today!